What is it like to have breakfast at Tiffany’s? We find out if dining at the iconic store is worth the hype. If you’ve ever wanted to channel your inner Audrey Hepburn and recreate Breakfast at Tiffany’s, now you can, with the recent launch of Tiffany & Co’s Blue Box Cafe at its flagship Fifth Avenue store in midtown Manhattan. But don’t be like Holly Golightly, on the outside looking in. To score a reservation at the uber popular 40-seat cafe you’ll need to book online via Resy 30 days in advance, and be poised to book once the booking window opens up 9am New York time; tables are snatched up within minutes. If you miss out, you can request to be notified when a table becomes available, but you’ll need to monitor your email notifications like a hawk to secure a booking. So with a little pre-planning you’re in! But is it worth the hype? Arriving at the iconic store, you’re whisked up to the fourth floor by the most charming elevator operators. It feels like a throwback to a bygone era, like when the movie made its debut in 1961, and adds to the sense of grandeur. Weave your way through the tempting selection of Tiffany’s new luxury home and accessories collection and arrive at Tiffany’s first ever dining concept – the Blue Box Cafe. It occupies just one small corner of the floor, making it an exclusive event. 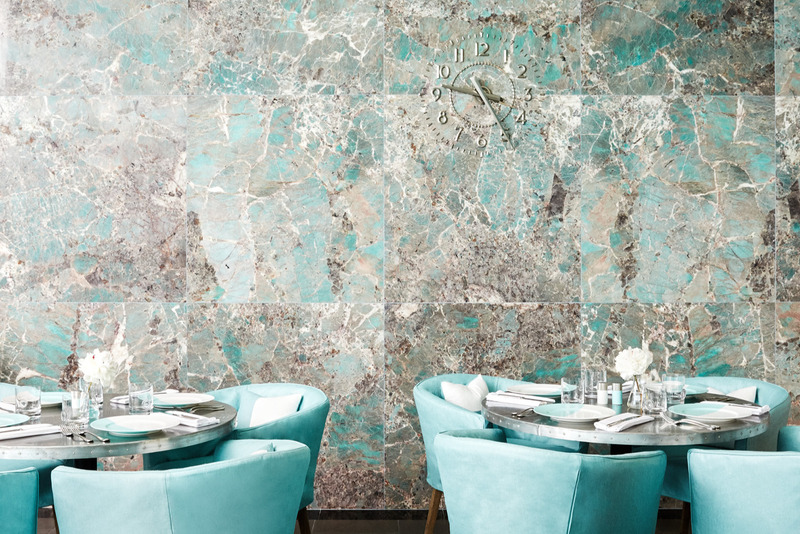 The cafe is a sea of Tiffany’s signature blue: from the walls, chairs, banquette seating to the bone china and elegant salt and pepper shakers, and it’s heavenly for any Tiffany & Co. fan. We’ve scored a table for the first sitting of the day, 10.15am – just after the store opens. We’re delighted to learn that despite the strict allocated arrival time when booking, there is no rush to leave; instead you can savour the experience at your leisure. Better still, you can decide on the day whether you’d like to choose from the breakfast, lunch or high tea menu. The prix fixe menu starts at $44 for a two-course breakfast including your choice of tea or coffee. Two-course lunch is $58 and Tiffany Tea is $71. Opting for the breakfast menu, the first course arrives featuring seasonal berries and croissants served with whipped honey butter, sour cherry-cranberry jam and classic Nutella. It’s the perfect start and is a nostalgic nod to Holly Golightly nibbling her croissant at Tiffany’s all those years ago. Our second course is an American favourite reimagined by Tiffany: smoked salmon and bagel stack with cream cheese smear, beefsteak tomato, red onion and capers. The bagel is sliced as wafer-thin crisps making for an elegant rather than filling breakfast. Other breakfast options included coddled eggs, avocado toast or buttermilk waffles. If you’ve left room for a sweet treat, order the Blue Box Celebration Cake, a recreation of the iconic Tiffany box in chocolate and Grand Marnier and smothered in Tiffany Blue fondant. There’s a further selection of desserts, plus a range of teas, wine and bubbles on the menu. Service exudes quality and sophistication and staff seemingly glide around the room – all helping to create a relaxed and unhurried dining experience. Believe the hype, breakfast at Tiffany’s is a quintessential New York experience and should be added to your must-do list when travelling to the Big Apple.